Onuma Alt is an altbier from Onuma Craft Brewery that is top fermented beer brewed with caramel malt to produce an abv of 5%. 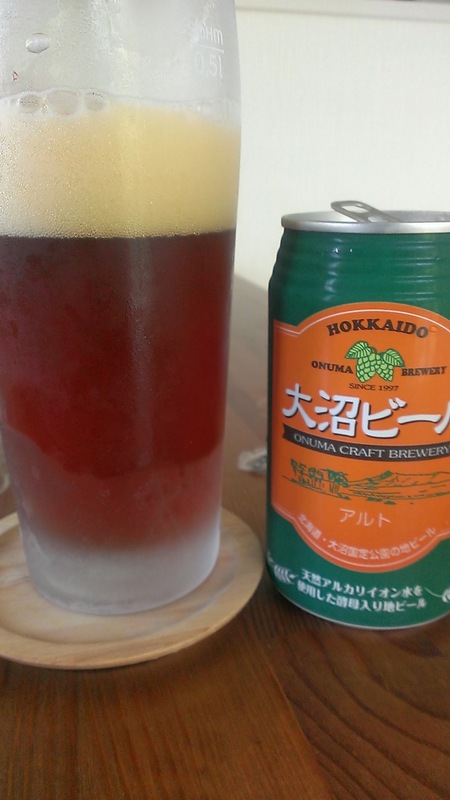 I first drank this a couple of years ago on a beer tour of Hokkaido though I wish BeerTengoku had been around then as I visited a couple of breweries that I should have written about. Damn. Means another trip to Hokkaido and more beer. Couldn’t find my usual glass for Onuma Alt and the wife had put this one in the freezer. Damn. Altbeers aren’t a common style in Japan even though the industry owes Germany a large amount of gratitude for helping develop it. Pilsners, weizens and dunkels are all readily apparent though with altbeers, they are few and far between. I guess the top fermenting style is harder perhaps for breweries to do than the bottom-fermented style that is utilised in lagers. Alts are beer style I would like to see more off being developed in Japan as the deep colours and malts provide a stark contrast to the brighter, golden colours of pilsners and weizens. Onuma Alt poured out a deep reddish brown colour with a slightly off-white brownish head on top. The caramel malts were not immediately apparent though and needed warming up to develop. There was a nutty, caramel malty aroma coming off the beer along with some vague hints of hops though they were blink and miss it. The flavours in Onuma Alt were standard for the alt beer style with the malts being the main star of the show – sweet, caramel flavours that developed nicely as the beer warmed up but there was distinct lack of carbonation which reminded me of an English ale. But where were the hops? If they were present, then the malts must have masked them as I really couldn’t detect any bitterness nor hoppiness. Onuma Alt is ok but never really seems to get going, even when warmed up. A shame. Onuma Craft Beer online store.